The holiday season is one of the most exciting times of the year in Indianapolis. The city is covered in beautiful festive decorations, and there are countless events that you can choose for a memorable Christmas season. If you want to have the most fun possible this holiday season, you need to learn about a few of the best activities you can find in the city. If you’re looking for one of the most memorable holiday events in Indianapolis that can be enjoyed by the whole family, there’s no better option than attending Christmas at the Zoo. A holiday event that dates back to 1967, attending Christmas at the Zoo is a great way to kick start or close out your holiday celebrations. During this event, the Indianapolis Zoo is decorated with thousands of lights, and this year, you can also stop by the Bicentennial Pavilion to spend some time in Santa’s Village. While enjoying the holiday decorations, you can also see some of the zoo’s most popular animals, including red pandas, tigers, and even sea lions. There are also several indoor exhibits that you and your family are sure to enjoy. Hours for this event are 5:00 p.m. to 9:00 p.m. during the week and 5:00 p.m. to 10:00 p.m. on Friday and Saturday. If you’ve never spent the Christmas season in Indianapolis, then an event that you must attend is Jingle Rails: The Great Western Adventure. Held at the Eiteljorg Museum of American Indians and Western Art, this model train exhibit features scale models of some of the most notable spots in the country, including Lucas Oil Stadium, and all of them will be draped in their holiday finest. This exhibit runs until January 15th, and you only need to pay admission to the museum. Anyone in Indianapolis that plans to do some shopping this Christmas should be sure to look for their gifts at the Christkindl Village. An annual German Christmas Market that’s a favorite of Indianapolis residents, Christkindl Village is a great place to get into the holiday spirit. 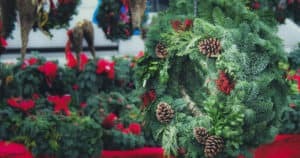 As you would expect from a Christmas market, there will be a variety of vendors featuring skillfully made crafts, and you can also find German food and a beer garden. There are also great activities for kids of all ages, including an alpine slide. Christkindl Village is open December 15, 16, and 17, and admission is free. No Indianapolis Christmas is complete without a visit to Santa, which means you should head on down to the Circle Center Mall with your wish list in hand. Every day until Christmas Eve, Santa will be available for children of all ages, and you can even take a photo to commemorate your visit. You can visit Santa during normal mall operating hours through most of December. However, St. Nicolas leaves early at 6:00 p.m. on Christmas Eve so that he can get everyone’s presents delivered by Christmas morning. If you want a fun and memorable Christmas in Indianapolis, you should make sure to participate in all of these exciting December events.